Sunday may have been a day of celebration for Lewis Hamilton, but an enthralling race offered a serious wake-up call for Mercedes. The coronation of only the third five-time champion in Formula 1 history may be the major news following Sunday’s Mexican Grand Prix, yet it was secured in anything but the fashion Lewis Hamilton would have liked it to have been. Despite parting the Red Bulls like the red sea on the run to Turn 1 and sniffing for the lead, Hamilton would ultimately finis the race a distant fourth, almost 80 seconds back from race winner Max Verstappen. 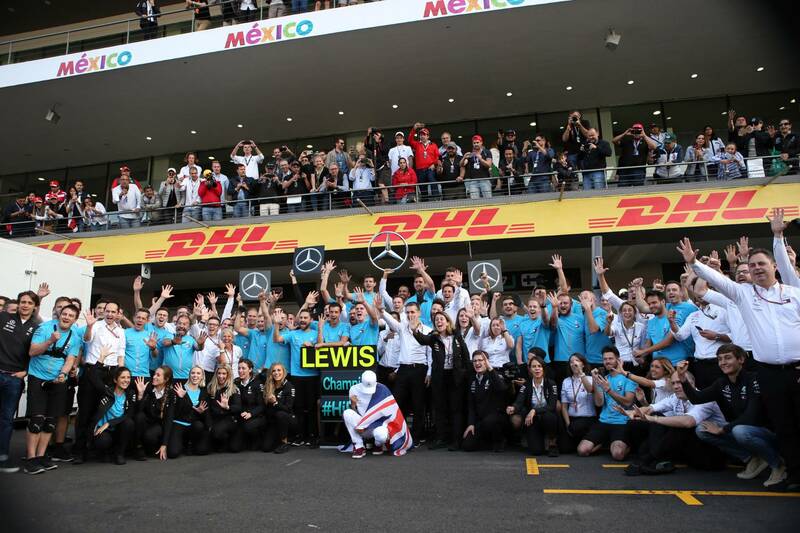 It was enough to nevertheless clinch the drivers’ championship with two races to spare, but Hamilton conceded himself after the race that he felt mixed emotions: elation over the fifth title, but tinged with disappointment for the difficult afternoon he’d endured on-track. The race that played out was one anticipated after Friday’s practice running. By bringing its safest possible tyre selection to Mexico, Pirelli had left teams scrambling on strategy, particularly as none of them had anticipated the issues that emerged on Friday at the Autodromo Hermanos Rodriguez. But it resulted in a thrilling, unpredictable grand prix that shook up the competitive order near the front of the pack as Red Bull came to the fore, leaving Mercedes in particular without answer. The suggestion Ferrari was the only team that could realistically take the fight to Red Bull in Mexico came on Friday in practice. While Sebastian Vettel and Kimi Raikkonen had both struggled, finishing P4 and P8 respectively, the team seemed confident of why the deficit was so great and that it had the ability to fight back in the long runs. Mercedes, meanwhile, openly said it was unsure as to why it was so far back. Mercedes managed to recover some of the deficit in qualifying after getting its engine working in a sweeter spot, allowing Hamilton to secure P3 on the grid. He then made a rocket start to split the Red Bulls on the run to Turn 1, eventually settling down into P2 on the opening lap. But that would be as good as it got for the champion-elect. While the front-running teams may have been eager to qualify on Ultrasofts given the tiny window the Hypersofts would be able to run in, the purple-ringed tyres weren’t that much better. Just a few laps in, Hamilton began to report graining, with the drop-off to Verstappen at the front coming around Lap 8. Verstappen pulled out 4.5 seconds in just three laps, prompting Mercedes to bring Hamilton in for a pit stop, moving him onto a set of Supersofts. From there, the plan was to one-stop Hamilton. It was a strategy the other front-runners were also trying to make work. Fearing that he would lose even more time on the undercut to Hamilton, third-placed Daniel Ricciardo came in one lap later, with Verstappen then coming in one lap after that. By the time he got back up to pace, the Dutchman was sitting around nine seconds clear of Hamilton. The only team to try something different was Ferrari. Vettel told the team he wanted to keep his tyres hanging on for as long as possible, with Kimi Raikkonen mirroring his strategy. Running P4 and P6 before the pit stops, both were in need of a serious upturn in fortunes. Going long did neither much good in the short run, but would later pay dividends. By the time all had pitted, Vettel had tyres six laps fresher than Hamilton’s, with the gap to his title rival standing at around five seconds. He may have stood little chance of keeping the championship race alive to Brazil, but the Ferrari man wanted to go down fighting. Only around 15 laps into his Supersoft stint, Hamilton was beginning to report concerns about getting the compound to the end of the race. The gap to Verstappen had swelled to over 13 seconds despite the Red Bull driver being told to match Hamilton’s times, given he too was meant to one-stop. But while Verstappen had the luxury of a fresh set of Supersofts to stick onto his car if he were to pit again, Hamilton was left with only a set of five-lap old Ultrasofts to put on. Vettel, Raikkonen and Ricciardo all had a fresh set of Ultrasofts at their disposal, meaning a second stop would not be the end of the world. Vettel’s decision to go long with his Ultrasofts at the start quickly began to pay dividends. He breezed past Ricciardo for third place, aided by the traffic both were hitting, and then immediately dropped his former teammate, setting his sights on Hamilton. As exciting as the prospect of an on-track battle between our two title contenders may have been, it hardly lived up to any expectations: Vettel breezed past Hamilton and was five seconds up the road within three laps. It was a repeat of the tyre woes Mercedes had endured in Austin, only magnified by the softer selection Pirelli had brought and, having stacked up on Hypersofts like everyone else, the lack of available sets for the race. Its pace was so poor that Bottas, who had been running 15 seconds ahead of Kimi Raikkonen after both had pitted, was now being caught by his compatriot. A mistake at Turn 1 was proof that his tyres were done, prompting Mercedes to bring him into the pits. The same thing had happened to Hamilton just a few moments earlier as he came under intense pressure from Ricciardo in the fight for fourth. Ricciardo’s tyres were beginning to come alive again after passing through the graining phase. Come Lap 47, Mercedes thought it had little choice but to bring Hamilton in and give him the used Ultrasofts. It was damage limitation, even if he only had to finish seventh to clinch the title. Ferrari, meanwhile, was also shifting to a two-stop strategy with Vettel. Having cleared Hamilton and put in some quick lap times to trim down the gap to Verstappen at the head of the field, there was a sense he could yet catch the Red Bull man and claim an unlikely victory. Vettel also pitted on Lap 47, taking a set of fresh Ultrasofts that would light the fire under Verstappen. Red Bull played it sensibly, avoiding the same trap Mercedes fell into with Hamilton in Austin by reacting immediately and pitting Verstappen one lap later. He came out still leading with an eight-second buffer to Vettel and a fresh set of Supersofts underneath him - and crucially, a driver between them. The strange nature of the Pirelli tyres in Mexico meant Ricciardo was actually finding time as he ran long on his Supersofts, allowing him to sit P2 between Verstappen and Vettel. While Vettel was able to quickly catch up, passing was proving difficult. The RB14 remained mighty through the middle and final sectors, with strong traction exiting the last corner making it hard for Vettel to catch up. Ricciardo escaped DRS range, and then even set the fastest lap of the race on the 45th lap of his stint. Second place was on. But then Lady Luck reared her cruel head once again: Ricciardo’s engine began spewing smoke as an issue forced him to park up at the side of the track and retire from the race, ending his hopes of a first podium since his Monaco victory at the end of May. It was quite the come-down for Saturday’s pole-man. It was only at this point Verstappen began to get a bit nervous. Before then, his engineer had been stressing to him about how all he had to do was match Vettel for pace and keep the gap stable. With Ricciardo in the way, there was no point overcooking things. Verstappen was quick to ask if the team needed to turn his engine down for fear of the same issue emerging on his car, but he was told to keep his head down and focus on maintaining the gap at the front. Verstappen didn’t pay much attention to this, though. On the first lap after the Virtual Safety Car to allow Ricciardo’s stricken car to be cleared, Verstappen set the fastest lap of the race. “Slow down mate, we don’t need it,” race engineer Gianpiero Lambiase said. “I know we don’t need it, but it’s nice!” quipped Verstappen. After a stern final warning a couple of laps later, and having been informed that Valtteri Bottas now had the fastest lap after pitting for Hypersofts, Verstappen’s engine was turned down, forcing him to back off. 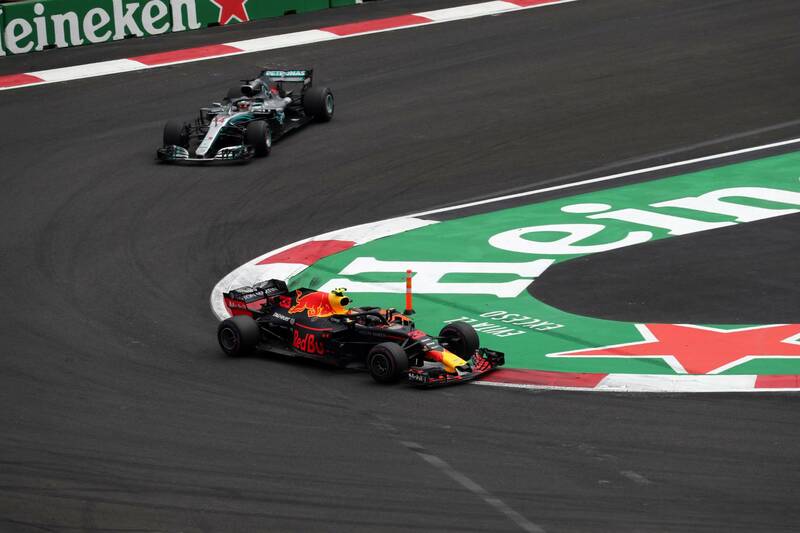 What was so impressive about Verstappen’s display in Mexico was just how complete it was. With the exception of the 0.026-second gap to Ricciardo in qualifying on Saturday, he did not put a foot wrong all weekend. His tyre management was supreme, his pace all-conquering - nobody could get close to him. Throughout the race, he was constantly enquiring about the pace of the cars around him, knowing when it was time to push and time to back off. For a man of only 21 years, it was a hugely mature display. And while there was jubilation for Mercedes upon Hamilton’s coronation as a five-time world champion, there were also some warning signs ahead of the final two races. It was fine over a single lap to compete with Red Bull and Ferrari, but over the long runs, its tyres were quickly cooked. Had P4 not been enough for Hamilton to win the title, we’d most likely be looking at this as one of Mercedes’ worst races of the season. One championship may be over, but the second is still alive. 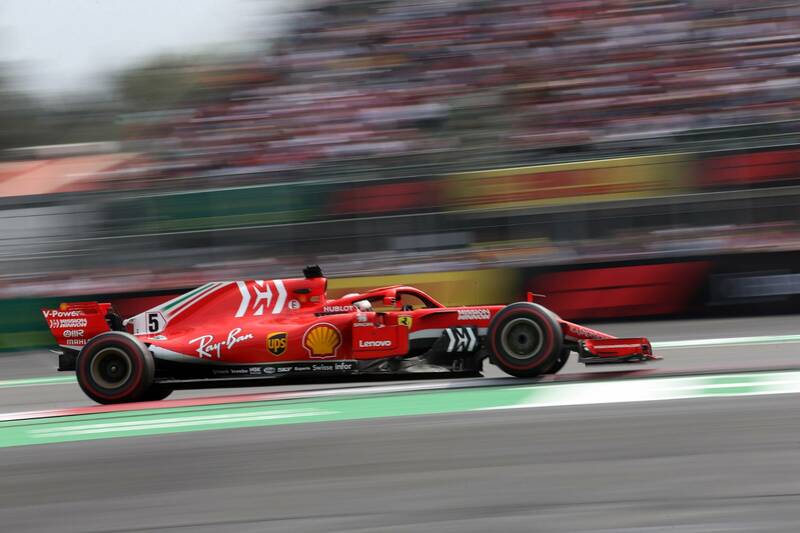 Ferrari managed to gain 11 points on Mercedes in the constructors’ standings with its double-podium finish, cutting the gap to 55 points with 86 still to play for. The odds are still heavily stacked in Mercedes’ favour - Ferrari needs to outscore it by 13 points in Brazil to have even a chance in Abu Dhabi - but this race proved that it is far from infallible. While Brazil will have a tyre selection more suiting Mercedes, with Mediums, Softs and Supersofts, Abu Dhabi will see the return of the softest possible selection that we saw in Mexico: Supersofts, Ultrasofts and Hypersofts. With high temperatures due at Yas Marina, could Mercedes find itself on the back foot once again? Even in the heady daze of his fifth title win, Hamilton had no plans to take his foot off the gas until the end of the season. “I still have work to do. I’ve still got to get back to the factory and rally the troops next week to figure out how we can come back and win these next races,” he said. As complicated as Pirelli’s tyre selections and names may be at times, in Mexico on Sunday, it proved to be the spice the race needed. It may have been too late to have an impact on the title race, but today’s grand prix ensures the final two rounds will be far from dead rubbers.